Have you seen Lily Jade's diaper bags? I have pretty much been mooning over them since sometime before I was pregnant with James. When Paul asks if there's anything I want for any anniversary/Christmas/birthday I usually sigh dramatically and talk about this wonderful, beautiful, perfect diaper bag that is a backpack too and oh-my-goodness how awesome would a backpack/diaper bag be? until his eyes glaze over and I realize that I'm really only talking to myself about my favorite bag. I've also been stalking Thred Up for a Lily Jade bag that someone has parted with, because I've been gradually accruing Thred Up credit sending stuff in as I've slowly cleaned out my closet... but alas, I have yet to see one appear second hand. And I realize it's totally silly, because I've never even been a bag type of girl and when my friends were excited about designer bags in college I was rolling my eyes over the prices but "Look," I tell Paul, "look that the baby bag! It's so practical!" It's not really a realistic possibility at the moment, although I do enter just about any Lily Jade contest that I see going around, and one of these days I'm bound to win, right? Which is the point of this post (because by now you're probably wondering if there is a point). 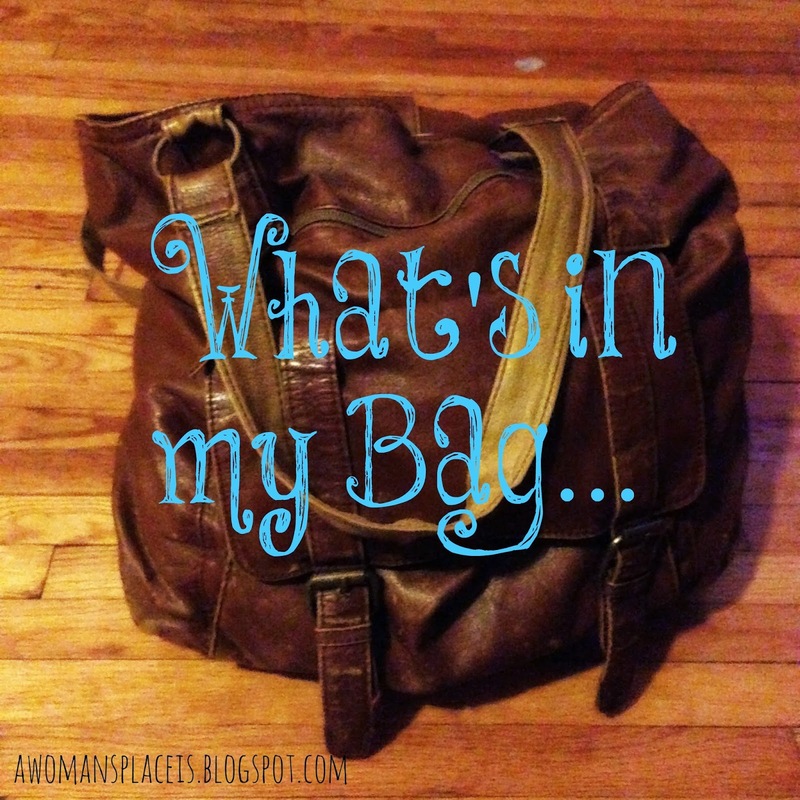 Nell is hosting a What's in My Bag Linkup that includes a giveaway that will involve not one, but three Lily Jade bags. And to enter they're asking for a "what's in my bag" post. So I got out the camera and dumped my bag out on the middle of the living room floor, while James complained that he didn't have 100% of my attention (and I'm pretty sure he was thinking "Mom! It's ten o' clock at night! This is when I throw a party that all my siblings are asleep and it's just you and me!") and I started snapping pictures. And here's the result. Pack of allergy melts for Sadie... or Patch... Or Maggie... or Me. Packets of antibiotic ointment that have been in my purse since I stepped on a nail and had to have it removed in the ER. When I was pregnant with Patch. I should probably toss those. The Kindle Fire Sadie was given for Christmas a couple years ago. Gummy worms to bribe the kids when I really, really, really need them to be quiet. Did anyone actually hang in there and read that? I'm actually kind of surprised at how long the list is, because it didn't really feel like there was all that much stuff in there! Fingers crossed! 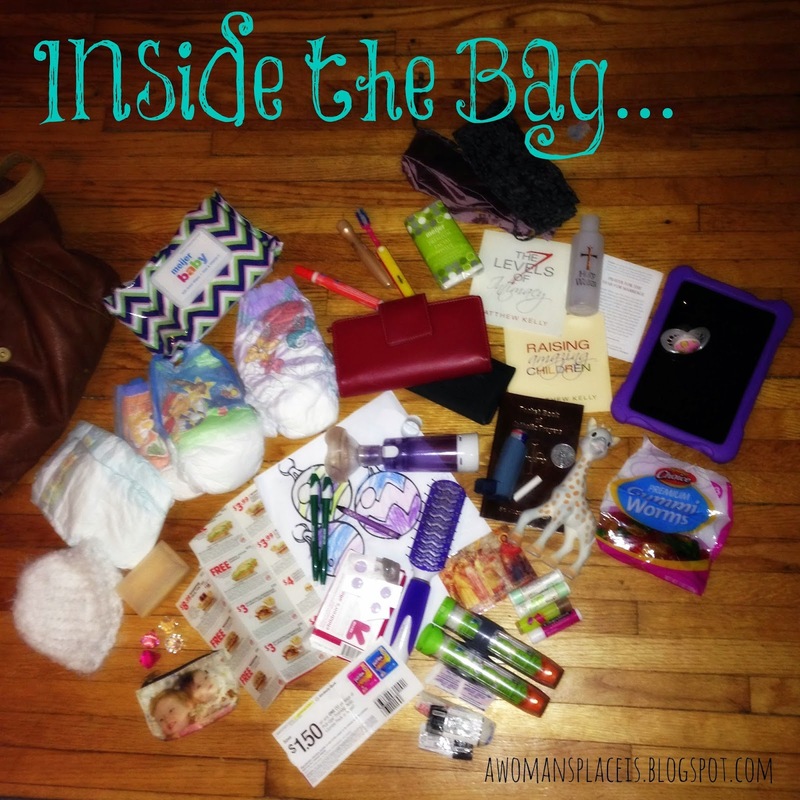 Because the contents of that diaper bag could really use a "Baby Bag" to help organize it! I really like the bag you have - it can fit all that stuff and is very attractive! However; I hope you win the Lily Jade one! Thank you! It's one of my favorites too and almost feels bottomless. It's so huge it can fit just about everything, which makes it very handy! That is fantastic!!! I especially like "somebody's toothbrush" and "blessed chalk" (???) I think your contents are incredibly eclectic and certainly prizeworthy. I will say a little prayer that you win. Thank you! And I have no memory at all of how a toothbrush even came to be in my purse. The blessed chalk was handed out at Epiphany, but Paul grabbed some too, so we used his to write the blessing over the door. I knew mine had to still be in there, but it had fallen out of the paper I'd wrapped it in and gone missing. Until yesterday that is!